Midget racing dates back to the 1930’s, and the basic concept has always been the same. Place the greatest amount of power on the smallest frame possible and put on an exciting show. The small size of these machines, combined with their power-to-weight ratio (2.5 pounds per horsepower), makes them perfect for oval tracks that are .5 mile and smaller in length. But, turn them loose on a larger track, and the speeds can reach over 150 mph, making them attractive for almost any racing facility of 1 mile or less. 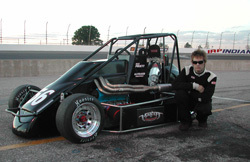 USAC Midget racing has been a proving ground for some of the nation’s great racing talent, due in part to the variety of tracks and the quick reflexes necessary for this type of racing. Former National Midget Series standouts Jeff Gordon, Tony Stewart, Billy Boat, Ryan Newman, Jason Leffler and John Andretti have turned a spotlight on the series as a source of racing talent. Other notable drivers who have made their way through the USAC Midget ranks include A. J. Foyt, Mario Andretti, Johnny Rutherford, Parnelli Jones and Mel Kenyon.